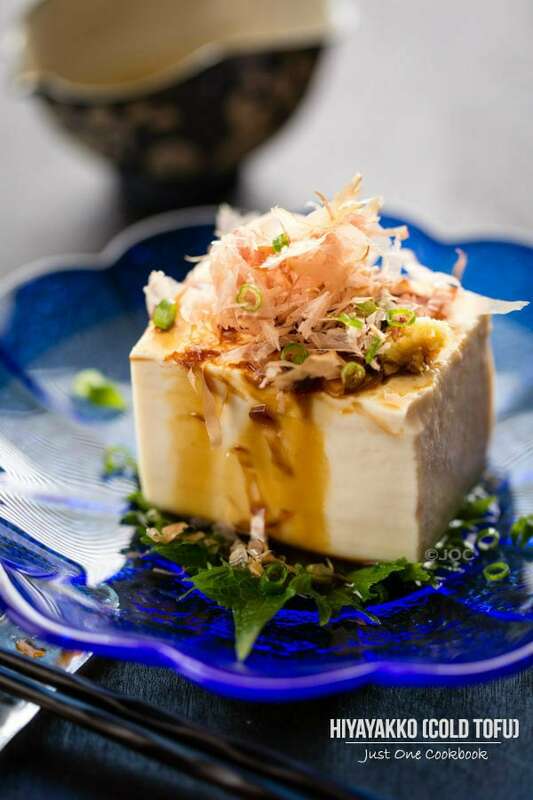 Hiyayakko (Cold Tofu 冷奴) is a Japanese chilled tofu appetizer and it’s usually served during the summer time. The hiyayakko is usually topped with katsuobushi, green onions, grated ginger and season with a little bit of soy sauce. However, this dish can be versatile; be creative with toppings and seasonings to enjoy chilled tofu. 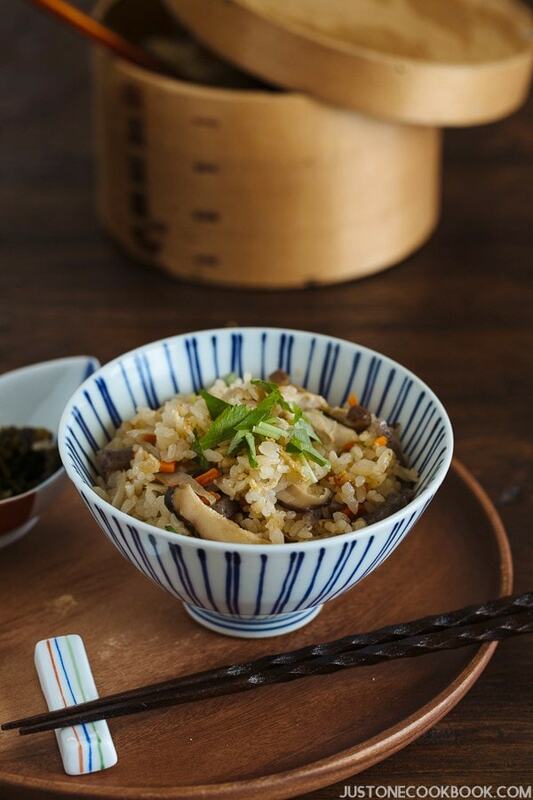 You can create any hiyayakko recipe you like. It can also be vegetarian if you omit katsuobushi and use vegetarian condiments. 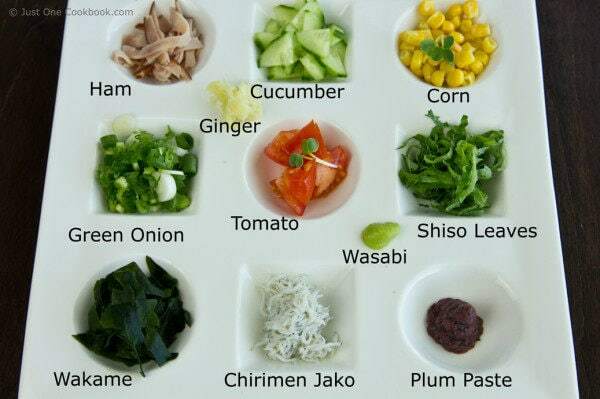 These toppings below are just a few of my favorites. Before going to the recipe, I want to thank you for stopping by Food Lovers Website to check my interview with Correen. Cut chilled tofu into 4-6 pieces. Put each piece of tofu on a serving plate and top with your favorite toppings. Pour soy sauce or other sauce on top before serving. Stunning presentation Nami! And that plate with all the toppings looks soooo beautiful! Buzzedddd!!! Yes Nami stunning presentation!! I love the plate! Such a beautiful, healthy dish! Bravo Nami! Nami, what an amazing presentation of the ingredients! I would love to have such a cute plate on my table! I think we are linked by telepathy. 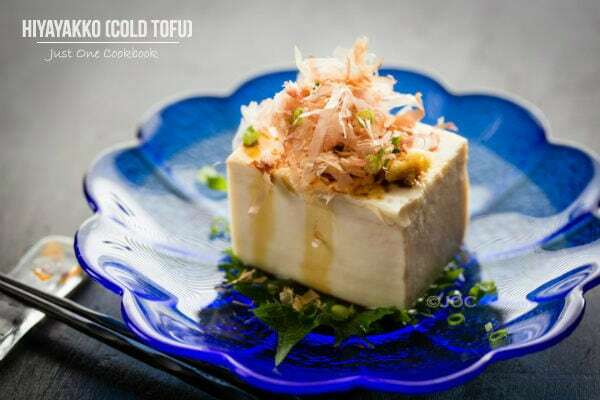 I feel as if you had posted it especially for me: it has been so hot for several days, I crave this tofu dish even without knowing how it tastes. I simply feel it would be so coooooooling. Really, excellent idea with the toppings! Your photos get more and more beautiful! Some (like me) should learn from you! The last one is simply a piece of art. Oh, I want this for lunch it looks so pretty & delicate. I love all your dishes and soy sauce container. I wish there was a good Japanese restaurant here that served everything you post with all your beautiful coockeery too, that would be lovely!! Absolutely beautifully presented! It looks so lovely and sounds delicious! I haven’t made this type of tofu dish before but your pictures are stunning! Love the topping plate; it’s just too cute. I normally use silken tofu for dessert with some ginger simple syrup. It melts in your mouth and the ginger gives it a great kick! I’m sure you’ve heard of this dessert. Yum! The photos look great — really 😉 and I love all the topping options. Congrats on the interview and heading over to read. I love this post! So informative!! Great photos, and really interesting way of presenting the food. I haven’t seen this kind of plate before. This is such a great post. Never had something like this but i would make for such a great party food! Headed to read your interview! Love the presentation! and that’s one good looking plate too! That looks so good! Cold tofu is great! I love the idea of playing around with toppings and making your own combinations! I will definitely try this out!! The pictures are gorgeous! can’t wait to try this dish! There is never a dish of yours I don’t want to try, Nami! This looks just so summery and inviting. Cold noodles and now cold tofu! I love these great summer dishes!!! Oh WOW Nami, this looks so beautiful! I grew up eating cold tofu with soy sauce and green onions as topping, and I just love how refreshing they are. Yours look 100 times better! Gorgeous! You’ve really out done yourself this week Nami. Where did you get that serving platter? I think I’m in love. Bookmarking this recipe for sure! Wow Ive never seen something like this, thanks for exposing me to this type of Japanese dishes. If you have a restaurant I will be an avid customer. Stunning presentation! You’re making tofu look more and more appealing to me. 🙂 I like the addition of ham on top. What a simply elegant dish. I would (almost) feel guilty about messing about the plate. You know my mom does something very interesting which you may want to try. You heat up some sesami oil and pour it over tofu. It gives you a very nice aroma as well as nice flavor! Oh what a nice idea! I never used sesame oil for hiyayakko! I have to give it a try! Thanks! So many choices…really great idea, and awesome presentation with gorgeous pictures. 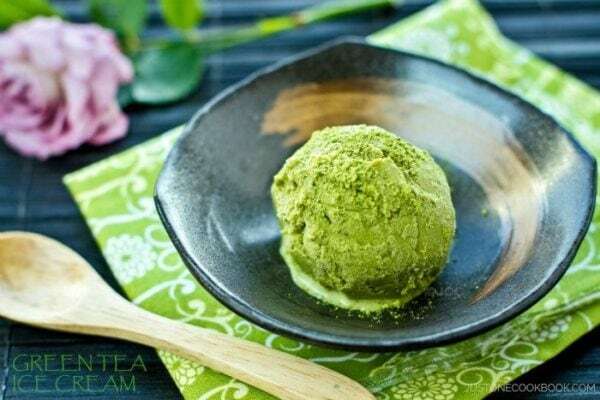 Nice post Nami, thank you for sharing such a great combination of flavors! Learning so much from you..Japanese food is darn healthy..I love the assortments of things to go with tofu..what a healthy meal! P.S. You changed the picture right? 🙂 I saw a beautiful diptych here in the morning..Anyhow you pictures are always so bright and colorful Nami..Love them! 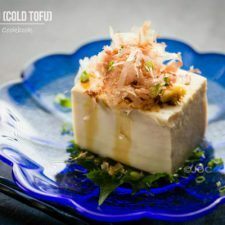 Nami, this cold tofu is perfect for the warm days…and I love how you add all the toppings, not only brings color to the dish but lots of flavors. Oh, I just love this. Tofu is a huge favorite of mine, I eat it at least twice a week and always cooked in some way. This has changed my mind. Such a lovely presentation and very cooling for the summer. This looks like a beautiful dish. I love the subtlety of it. Thats an awesome condiments plate! What a good selection! I did “Harumi’s” version, do you have her cookbooks? Its the one with Ricotta on the silken tofu with shiso and a soy/sugar/mirin sauce. SOOOOO good! Hi Lindsey! Ricotta? What a great fusion. I have to try the combination of Shiso and ricotta!! Beautiful Nami!!!! I am learning such new ways of eating, I have never tried cold tofu. But after reading this I sure will. I must say your recipes are so healthy and beautiful Yum Yum yum… Quick question do you prefer medium or soft tofu for this? I make a sauce for hiyayakko from salt-reduced soy sauce, mirin, fresh ginger, smoked salt and sesame oil ???? I pour that over the tofu and sprinkle vegetable furikake and then garnish with chopped chives or spring onions. I discovered hiyayakko in winter and now I am actually excited for Summer so I have a good excuse to have it for dinner ???? Nami, your tofu looks so delicious. Lovely presentation. Can you just use any kind of store-bought tofu for this, I wonder? I ask because a lot of store-bought tofu I get (most of them made in usa) have a funky smell! So different from the ones I can get in Korea– fresh made with real soybeans. What an excellent hot summer idea! I love the way you display all the different toppings in that cute tray. It looks so appetizing that way, and I bet the kids will eat a lot! What gorgeous photos! I love that dish with all the little spaces! Congrats on the interview, great job! 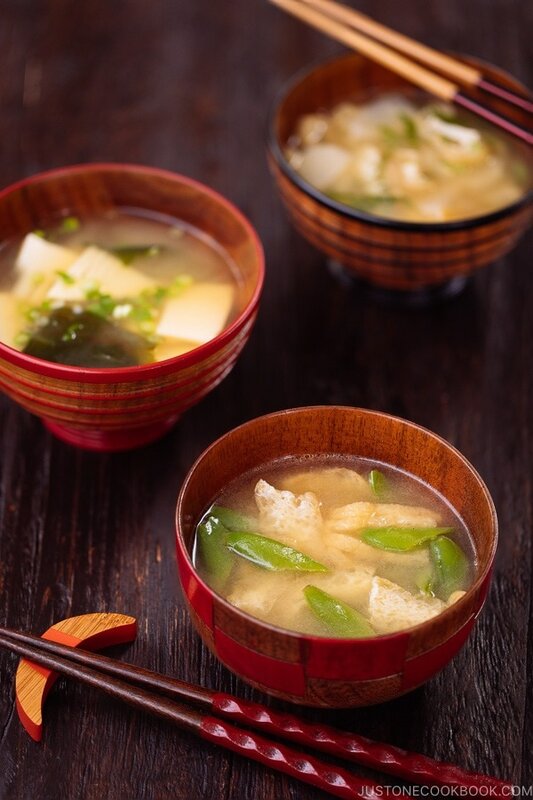 I love cold tofu Japanese style in winter but I think there are also many wonderful Japanese tofu for winter too and one of my fave is agedashi with the beautiful broth. I need to get that plate of yours! 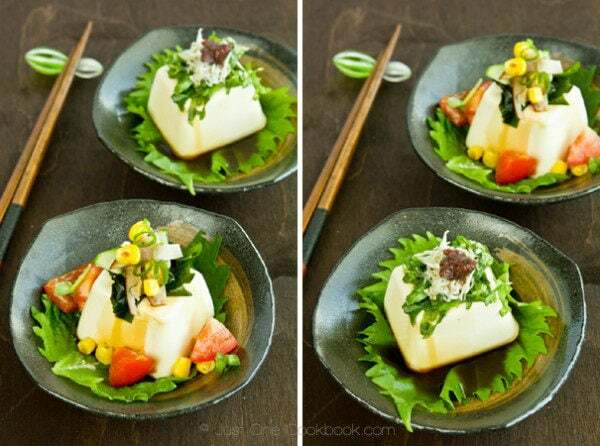 What a delightful way of serving tofu! Lovely presentation, Nami! I really love your dish with the accompaniments – everything looks so pretty served that way. I really should try tofu again. Talk about loaded with flavor! 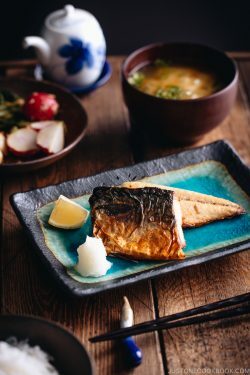 What are Bonito Flakes and how do you keep coming up with all these fantastic recipes. You are Wonder Woman in the kitchen! Gorgeous photos Nami! I love the look of this dish!! So Yummy! This looks so beautiful and that plate with toppings is just so cute, love all the colorful options! i love that plate with all the little compartments. i want to try this, now. I love my tofu hot, but your photos are sooooo tempting!!! Glad that I found your site. I love cold or hot tofu dishes. We now have a local Izakaya that serves out of this world “tapas” style dishes. These suggestions for serving the cold tofu will be great!!!! Quick, healthy, delicious what more could you want? Thank you. I have a question if you don’t mind! You suggest to be creative in using the toppings and that can goes limitless as you have shown. But what are the main essence of making this dish (as a guiding principles) – the freshness of the topping & tofu?, etc? Any tips on how to achieve the ‘balance’ between the tofu and the toppings? I love cold tofu too n wanted to share 3 ways that I do it…. Toppings options r a) crispy pork floss…this is stronger in taste n crispier than bonito flakes n very Sporean, b) chilled century eggs which are cubed, with a dash of spring onions, c) short thin strips of luncheon meat, bakedor fried till crispy…. I guess u can use ham or bacon n bake or fry for the same crispy crunch. Personally, I like the original taste of chilled tofu but family members may prefer seasoning sauce drizzled over tofu. I wld use a very simple combinationof sesame sauce with s lil oyster sauce, stirred till both r well mixed. I know above suggestions r so un-Japanese so u may say they are ‘Singaporean localized’……. Will continue to chk out ur wonderful blog! Hi Michelle! Thank you for finding my blog and I’m happy to hear you enjoy my blog. 🙂 Thanks for sharing your 3 ways of eating cold tofu! 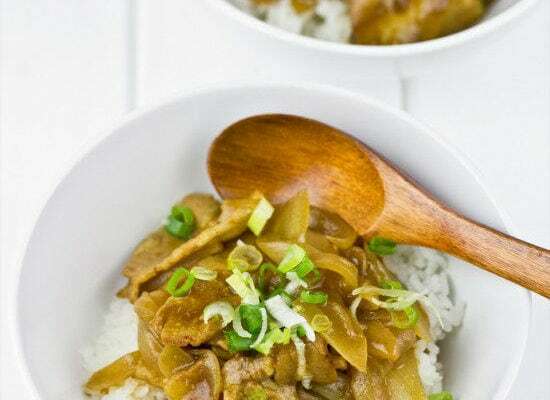 I’m sure everyone can take advantage of extra recipes from you – I love your Singaporean localized way! All I have been using is some Ponzu, grated ginger, chives (we grow them), and bonito flakes. I can’t imagine using hot toppings, as like you said, it would defeat the purpose of the dish. I have been eating this for breakfast (before I go to sleep as I work until 8 a.m.) when I don’t feel like making Okayu with Umeboshi. I have never had anything on hiyayakko besides scallions and bonito. I imagine they all enhance unique own flavor/texture to the tofu… I’m especially curious about the plum paste 🙂 Beautiful recipe! I love eating cold tofu with just some Boruto flakes and masago. Thanks for more topping ideas!! Hi Nami! Yesterday I saw Hirokazu Koreeda’s latest movie, Umimachi diary, have you seen it? It’s à story about three sisters who live in Kamakura, and a younger half sister who comes fr.o.m. Yamagata to live with them. In the movie, the sisters introduce their younger sister into eating raw chirimen jako on donburi or as a sandwich(? ), is it more like a local tradition? This movie shows even another local tradition making plum wine (both sweet and sour, could it be umeshu? And a local summer festival with water fireworks that seems to be very popular? Hi Genus! I didn’t know about this movie! I’m hoping that I can watch it online (or maybe Netflix?). I have to check it out! Thanks so much for letting me know. Yeah it should be Umeshu. Hi Nami, is it safe to eat an uncooked tofu? Usually i steam or fry the tofu. What a perfect way to use up my silken tofu! It seems so simple I wasn’t expecting it to be anything special, but it’s so cool and refreshing and delicious! I added ginger, soy sauce, and sesame oil, it was fantastic. 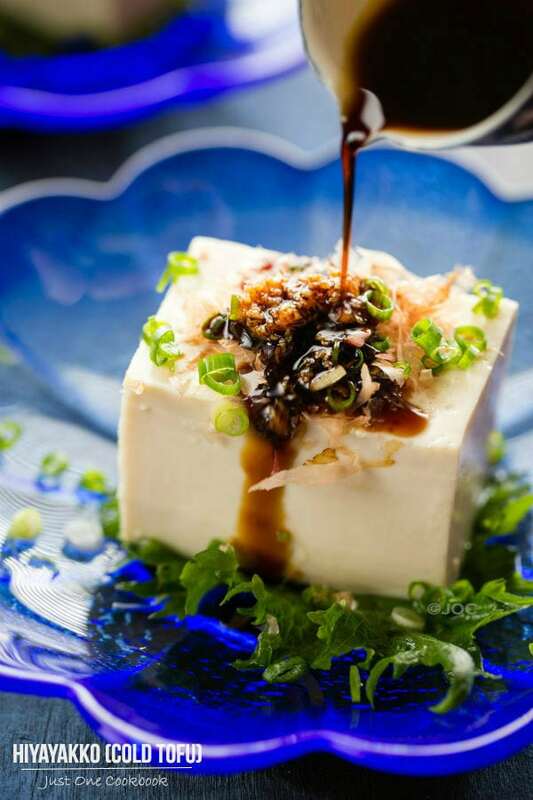 Does this dish taste the best with SOFT tofu, or does any firmness work? Does “Silken” always mean “soft”? I don’t know if someone already asked this, but just to double check, you don’t have to drain the tofu? Like, you don’t have to put a plate on top for the water to come out? hello! i love your website! 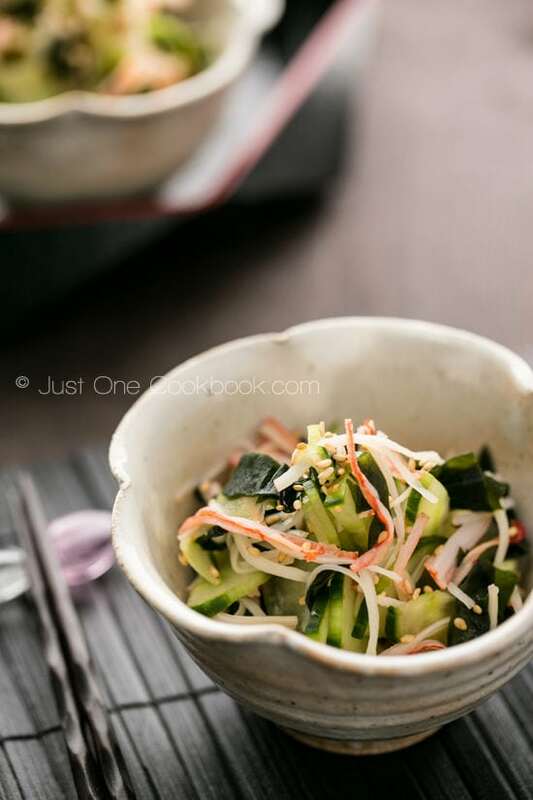 for this recipe and the topping of …dried wakame seaweed… do i just crumble it on top dry or hydrate it and chop it up? ?